A lot of you guys asked for some more healthy, vegetarian Weight Watchers recipes, so I’ve been whipping up few here and there, and I hope you’ve tried them and are enjoying them! Today’s recipe, my Vegetarian Philly “Steak” and Cheese Sandwich was SO good, that even my husband, steak guru that he is, really enjoyed it. 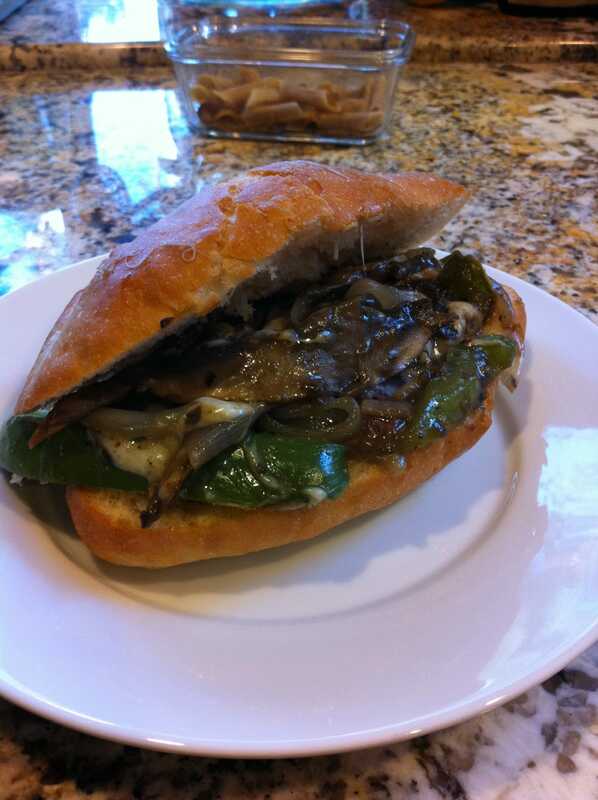 It’s made with Portabello Mushrooms, instead of steak, and is loaded with veggies and provolone cheese. You can make this recipe using regular, whole wheat sandwich rolls instead of the Fill’ems Sandwich Thins, if you’d like, but it will add another 1-2 Points onto your total. Because I’m the kinda gal who’d like the option of having 2 sandwiches, rather than just a bigger roll, I used the Sandwich Thins to keep the Points Value low. Each sandwich has just 4 Points, but if you feel like really chowing down, eat 2 for just 7 Points!! That is AWESOME. **Please note that in the photo is a regular, whole wheat roll, and NOT the Fill’ems Sandwich Thins that I recommend using in the recipe. The first time I made these, I used regular rolls and then switched to the Fill’ems to lower the Points count. A great idea for a low calorie sandwich recipe that tastes AMAZING! Enjoy all the flavors of a traditional Philly Cheesesteak, but with a lot less fat and calories. Though this isn’t an official one of Weight Watchers Vegetarian Recipes, it’s a great meal idea for any dieter who doesn’t (or does!) eat meat. Spray a large nonstick skillet with non-fat cooking spray and set over medium-high heat. Add onion and garlic, and cook, stirring often, until soft and beginning to brown, 2 to 3 minutes. Add mushrooms, bell pepper, and pepper and cook, stirring often, until the vegetables are wilted and soft, about 7 minutes. Reduce heat to low; sprinkle the vegetables with flour and stir to coat. Stir in broth and soy sauce; bring to a simmer. Remove from the heat, lay cheese slices on top of the vegetables, cover and let stand until melted, 1 to 2 minutes. I just made this and it was so delicious I didn't even take the time to sit down and eat it!! I'm not a vegetarian or a big mushroom person but this was definitely worth it!! I know, RIGHT??!! I'm not a vegetarian either, but if all Weight Watchers Vegetarian Recipes tasted this good, I'd become one! I need this in my mouth ASAP! So glad to hear you guys liked this dish. My husband is a total carnivore too, and he loved this. We'll definitely be making these again very soon. This may be a meat-free recipe but it is not vegetarian, unless the cheese came from a plant, or perhaps soy milk. Technically, dairy products are still considered vegetarian. Foods that don't contain any animal products at all, including dairy, would be considered vegan.